Serena Williams speaks to Venus Williams during their women's first round doubles tennis match against the Czech Republic's Lucie Safarova and Barbora Strycov. 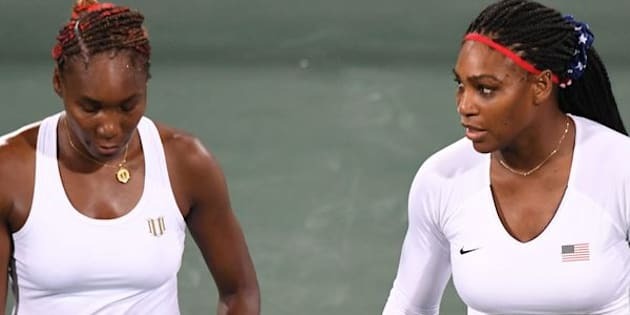 Venus Williams crashed out of the Rio Games tournament in the first round on Sunday as the American sisters’ unbeaten run dating back to Sydney 2000 came to a surprising end. The top seeds fell 6-3 6-4 to Czech pair Barbora Strycova and Lucie Safarova, ending any hopes of claiming a third successive Olympics doubles crown after they won gold in Beijing eight years ago and again at London 2012. The sisters won their first doubles gold in Sydney but a knee injury prevented Serena from playing at Athens in 2004. They have also won 14 women’s doubles grand slam titles, to go along with a combined tally of 29 major singles crowns. “I wouldn’t stay it’s devastating... we had a chance to compete for our country, we did the best that we can. We had a blast out there,” Serena, 34, told reporters. Both women have also won Olympic gold medals in singles play, with Venus triumphing in Sydney and then Serena becoming champion in London. Earlier on Sunday, Serena crushed Australia’s Daria Gavrilova 6-3 6-2 in her first round singles match, a day after Venus was eliminated by Belgium’s Kirsten Flipkens.